Taken from Sexual Personae, a book by Camille Paglia, exerpted from the chapter: 'The Birth of the Western Eye'. One of the most misunderstood features of Egyptian life was the veneration of cats, whose mummified bodies have been found by the thousands. 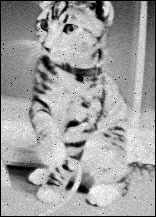 The modern cat, the last animal domesticated by man, descends from Felis Lybica, a North African wildcat. Cats are prowlers, uncanny creatures of the night. Cruelty and play are one for them. They live by and for fear, practicing being scared or spooking humans by sudden rushings and ambushes. Cats dwell in the occult--that is, the 'hidden'. In the Middle Ages they were hunted and killed for their association with witches. Unfair? [Perhaps, but] the cat really is in league with chthonian (i.e. of the underworld) nature, Christianity's mortal enemy. The black cat of Halloween is the lingering shadow of archaic night. Sleeping up to 20 of every 24 hours, cats re-construct and inhabit the primitive night-world. The cat is telepathic - or at least it thinks that it is. Many people are unnerved by its cool stare. Compared to dogs, slavishly eager to please, cats are autocrats of naked self-interest. Their 'evil' look at such times is no human projection: the cat may be the only animal who savors the perverse or reflects upon it. Thus the cat is an adept of chthonian mysteries. But it has a hieratic duality. It is eye-intense. The cat fuses the Gorgon eye of appetite to the detached Apollonian eye of contemplation. The cat values invisibility comically imagining itself undetectable as it slouches across a lawn. But it also fashionably loves to see and be seen; it is a spectator of life's drama, amused, condescending. It is a narcissist, always adjusting its appearance. When it is dishevelled, its spirits fall. Cats have a sense of pictorial composition: they station themselves symmetrically on chairs, rugs, even a sheet of paper on the floor. Cats adhere to an Apollonian metric of mathematical space. Haughty, solitary, precise, they are arbiters of elegance - the principle that I find natively Egyptian. Cats are poseurs. They have a sense of persona - and become visibly embarrassed when reality punctures their dignity. Apes are more human but less beautiful: they posture but never pose. Hunkering, chattering, chest-beating, buttock-baring apes are bumptious vulgarians lurching up the evolutionary road. The cat's sophisticated personae are masks of an advanced theatricality. Priest and god of its own cult, the cat follows a code of ritual purity, cleaning itself religiously. It makes pagan sacrifices to itself and may share its ceremonies with the elect. The day of a cat-owner often begins with the discovery of a neat pile of mole guts or mashed mouse limbs on the porch - Darwinian mementos. The cat is the least Christian inhabitant of the average home. In Egypt, the cat; in Greece, the horse. The Greeks did not care for cats. They admired the horse and used it constantly in art and metaphor. The horse is an athlete, proud but serviceable. It accepts citizenship in a public system. The cat is a law unto itself. It has never lost its despotic air of Oriental luxury and indolence. It was too feminine for the male-loving Greeks. [The cat] spoke of Egypt's invention of femininity, an aesthetic of social practice removed from nature's brutal female machinery. [The] aristocratic Egyptian women's costume must be called 'slinky', a word we still use for form-fitting evening gowns. Slinkiness is the nocturnal stealth of cats. The Egyptians admired sleekness in greyhounds, jackals and hawks. Sleekness is smooth Apollonian contour. But slinkiness is the sinuous craft of daemonic darkness which the cat carries into day. Cats have secret thoughts, a divided consciousness. No other animal is capable of ambivalence, those ambiguous cross-currents of feeling as when a purring cat simultaneously buries its teeth warningly in one's arm. Thus the Egyptian veneration of cats was neither silly nor childish. Through the cat, Egypt defined and refined its complex aesthetic. The cat was the symbol of that fusion of chthonian and Apollonian which no other culture has achieved. The west's eye-intense pagan line begins in Egypt as does the hard persona of art and politics. Cats are exemplars of both. The crocodile, also honoured in Egypt, resembles the cat in its daily passage between two realms; hefting itself between water and earth, the spiky crocodile is the west's armoured ego, sinister, hostile and ever-watchful. The cat is a time-traveler from ancient Egypt. It returns whenever sorcery or style are in vogue. In the Decadent aestheticism of Poe and Baudelaire, the cat regains its sphinx-like prestige and magnitude. With its taste for ritual and bloody spectacle, conspiracy and exhibitionism, the cat is pure pagan pomp. Uniting nocturnal primitivism to Apollonian elegance of line, it became the living paradigm of Egyptian sensibility. The cat, fixing its swift predatory energy in poses of Apollonian stasis was the first to enact the frozen moment of perceptual stillness that is high art. Don't forget Amy's lioness, Zola.